When you call a Wildlife Control Service, you want to be sure that they can control all of your wildlife problems. The last thing you want to hear is, that “We don’t do that”. You deserve a Full Service Wildlife Control Company to resolve your wildlife problem from the animal removal to the repair of the structure at the end of the project. Through the use of highly trained Wildlife Management Experts, we will solve the problem to your satisfaction! From Alligators to Zebras, one call is all you need to make to have your problem professionally resolved. A All Animal Control uses the Total Wildlife Control System to ensure your home or business is protected from all of the hazards wildlife can create. To fully ensure that your home or business is properly serviced, we take the following steps for a successful resolution of your wildlife problem. A very thorough inspection of the exterior, attic, basement and crawlspace is initially completed. The inspection will include such features as vents, chimneys and the landscaping. The entire outcome of the wildlife control service depends on this intensive inspection. 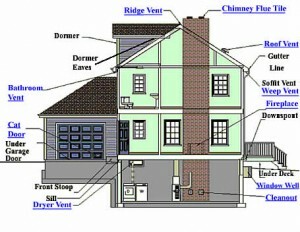 This home diagram shows the typical areas inspected. After the inspection is complete, a plan to control the problem and mitigate the damage will be immediately initiated. Quickly resolving your wildlife problem will help lessen the chances of damage and reduce your repair costs. Once the source of the wildlife problem has been removed or repelled, the repair, cleaning and prevention can be instituted. Our Wildlife Control Service Professionals will take expert care of your home or business and return it to a safe and healthy environment! Our specialty is complete full service wildlife control.